The second week of OTAs in the books and the Falcons were able to continue to plenty of things done to prepare for minicamp, training camp and the regular season. One of the good things about OTAs is players that were injured last season have a chance to rehab on the field with the team so they can be ready to go when training camp begins. That’s the case for running back Antone Smith who broke his leg on Nov. 16 against Carolina. Smith made his return to practice on Tuesday and he had to get back in the swing of things. Matt Ryan and Julio Jones are the top playmakers on offense. But Smith was the most exciting to watch because every time he would get the ball in his hands, it seemed like he would do something exciting. Smith ended the 2014 season with 144 rushing yards on 23 carries, 222 receiving yards on 13 catches and five total touchdowns. He averaged 6.3 yards per carry and 17.1 yards per catch. With a new coaching staff, one would think they would have let Smith go because he was an unrestricted free agent and he was coming off a broken leg. That was not the case as Smith signed a one-year deal worth $1.4 million back in March. One of the reasons Smith is back with the Falcons is head coach Dan Quinn loves what Smith brings to the table. Quinn also mentioned they are glad to have Smith back because he’s a factor on special teams. But running back is where Smith is at his best, and he’s coming into a situation where there is new scheme that should benefit his style of play. 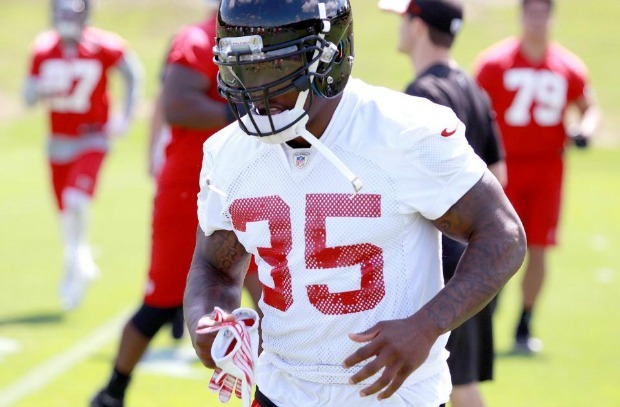 Right now, Smith is behind Devonta Freeman and Tevin Coleman for the starting spot at running back. Once Smith gets more reps during next week’s OTAs, minicamp and training camp he will be at 100 percent and throw his hat in the competition. But right now he’s taking it easy and making sure he can do all the things he was able to do before the injury.